by Pups The Traveling Labrador on Wednesday December 02, 2009. While I was in Austin I got to hang see the most amazing collection of Pawsome Labrador Art. 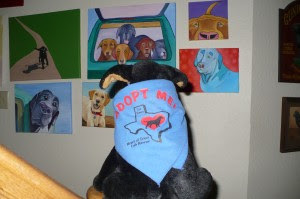 My host Ray from Heart of Texas Labrador Rescue has over 600 pieces of Lab art. Everything from paintings to sculpture to canes and a bunch of other stuff. He showed me some of the more interesting pieces. Like this Lab that was carved out of a single block of wood. He calls it the Lockness Lab because of its long neck. And then there is the amazing painting collection. Here are a couple of pictures of me with some of them. And if that were not Pawsome enough Ray has an incredible collection of Kitchen Magnets that he has collected from all the places in the world he has visited. I have been to many of them but some look to be very interesting places. I really want to go exploring in Egypt and Jordan. 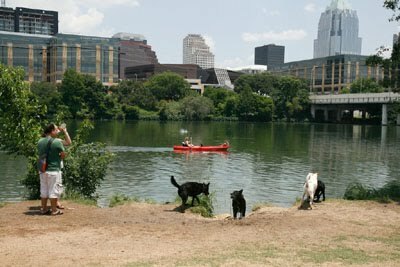 I bet there are Pawsome Mummies still to be found.